Published Dec 17, 2014 by Pearson IT Certification. Part of the LiveLessons series. Red Hat Certified Engineer (RHCE) Complete Video Course is a unique video product that provides a solid understanding of all the topics that are required to pass the Red Hat Certified Engineer (RHCE) exam. This title explores how to accomplish advanced system administration tasks, such as writing shell scripts, troubleshooting a server boot procedure, working with SELinux and firewalls and configuring different network services. 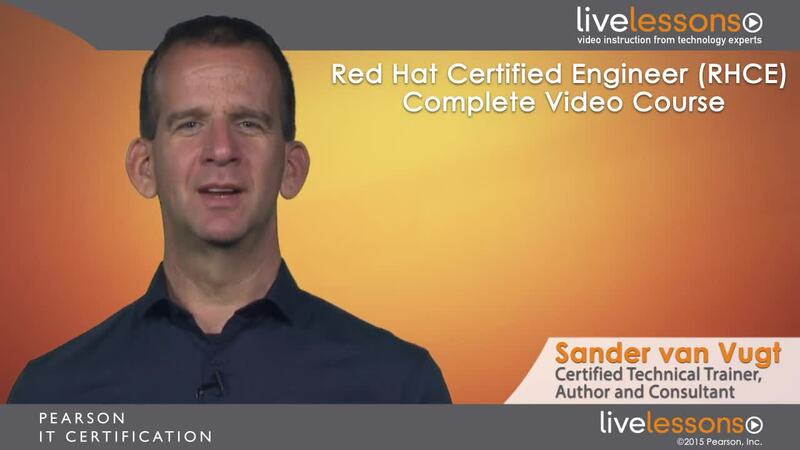 Red Hat Certified Engineer (RHCE) Complete Video Course contains 17 individual video lessons divided into four modules, for a total of more than 8 hours of training. The videos consist of live trainer instruction, white board training, CLI presentations, live demos, video screen casts and practice exam walk-throughs. The author covers all of the objectives in the exam so you can use this course as a complete study tool for taking the Red Hat Certified Engineer (RHCE) exam. Each lesson ends with a practice exercise, so you can practice within a CLI environment and put your knowledge to the test. Complete explanations for each exercise are also offered so you can check your work. Red Hat Certified Engineer (RHCE) Complete Video Course also includes interactive hands-on exercises for conceptual learning. Multiple-choice quizzes then end each module so you can test yourself on key concepts, commands, and more. In this lesson, you learn how to configure authentication using authconfig. You get insight in the configuration files behind it, and learn how to set up an IPA server as an LDAP and Kerberos server. In this lesson, you learn how to set up RHEL 7 as an iSCSI target using the LIO target software, and how connect RHEL to an iSCSI SAN using iscsiadm. This lesson shows how to apply Linux system optimization basics using /proc and sysctl. In this module, you learn how to set up advanced networking features as well as the Apache web server. This lesson teaches you how to configure Apache with TLS and how to secure it using authentication. In this module, different important back-end services are discussed. In this lesson, you learn how to set up Postfix as a mail relay server and how to send mail messages between Linux servers in a datacenter.